Guest Author's Note: I almost made this in my bath tub... Story Time: Tell of a time a movie monster (or a cheap knockoff) showed up in a game you were in. Newbiespud's Note: This is the last guest comic, folks! There's still plenty of intermission to go, but the rest is coming from me. This weekend's Fallout is Dragons is going to be delayed a bit by what can only be described as "emergency Spring cleaning." What page was the comic on when you first got here. Well, lets see. I found the story time video while I rummaging through YouTube back in December of 2013, listen to that a million times, and I think I realized there was a comic attached to it around the time page 397 was up. So I'll say page 397 is my answer. Some other bits of trivia, I think my first comment came around page 464 and I finally made an official account on page 477 (and the world was never the same after that). I knew about the comic from my bro around #15, but I wasn't a regular reader until around 40 or 50, I think. Now I am one of the old guard. You brats better behave, or I'll throw you in the dungeon! The dungeon is a terrible place, full of things that bite, sting, and vibrate. What kind of ungodly dungeon creature Bites,Stings,and Vibrates? There are the clamp lobsters, the whip weasels, and the buzz beetles. Been here about as long as Raxon. I'm pretty dang quiet, but I've been regularly reading practically the whole time, since shortly after it was first featured on EqD. 1000 so I'm bingeing. I should probably get of your lawn now. What page was up when I found it, no idea. What page when I caught up, no idea. What page when I started commenting, page 397, Without A Paddle. Unfortunately, I remember that one pretty well. Cause that was the one where I take up half of the comments. Eh, I wouldn't worry too much about it. I mean, it could have been worse. You could of jumped 50 ft and go into panic mode over a slight rebuke before filling up the comments with your attempt to make everything right. Though, now that I'm thinking about it, we've come a long way since we got here, haven't we? That's actually a rather neat thought. Somewhere between #3 and #6 I think... it's been a long time though. Been here since around page 7 or 8. Came for the ponies, stayed for the plot. I don't remember exact when it was, but if I remember correctly it was in early 2013, and I think it was actually part of what got me into the pony fandom in the first place, so as a rough estimate I'd go for somewhere between 230 and 280, or there abouts. Somewhere close to the end of Dragonshy arc, I'd wager. 'Honestly can't say which exactly. It was during July, 2013; I know that much. Until a handful of pages ago, I mostly lurked. Dang. It's been about two years since I started reading, I think. I was still new to college at the time...I stumbled upon this comic during my first D&D campaign, looking for a D&D/FIM crossover comic. Ahh, nostalgia. I was lead here by Equestria Daily. Specifically, this post from 2011: http://www.equestriadaily.com/2011/09/comics-friendship-is-dragons-granny-pie.html which refers to this comic which has twenty-odd pages of ponies. So I've been here rather a while. And I still never comment. It's interesting I've been here for so long. That was only three months and one day after I joined the fandom; I don't remember having gotten into Friendship is Dragons so early on. According to my posting history it was Page 21, "Secrets and Lies", Sept. 24, 2011.
uh...somewhere in the 350s I think. Maybe as early as 357, or as late as 364-ish. something like that. I didn't start commenting until much later because i had no real stories to share at the time. My old username is first encountered on page 12! Well if I recall correctly, I believe I joined some where between the Dragonshy arc and the Diamond dog one. Not necessarily one of the old guard but a veteran for sure. As for posting regularly it has yet to happen. Hell you might as well say this comic is really got me into roll playing. I had always been interested before, but after having read all the shenanigans that went on while reading all the comments it made it sound like a great time. So thanks Spud! Because of you (and quite possibly some Raxonian based influence) I have become an avid table top player ever since August of 2014! We play every other week on sundays and so far the campaign is great! As a side not for any who care (and also because I for once actually feel like sharing my story) we started with a group of 10 people which from my understanding is a MASSIVE group. Combat was slow but still awesome. We've dwindled down to 7 since then, but the campaign (pathfinder btw) is going strong and I actually have a great DM! I also decided to go as our party's cleric. We had two to start off but the other one decided to change to a different character. Any who I don't have to worry about healing too too often as most of our other players are veteran table top gamers and know what they're doing. Between a barbarian who has literally cleaved two people in half with a single swing, a fighter whom nothing the DM throws at can hit, a glass cannon of an inquisitor whom tosses out some mad dps, a gunslinger who is also a bard, the tengu sorcer who loves shiny things, the ninja who is constantly stabbing our enemies in the back, and my pyromaniac of a cleric, we're doing ok. Hell we got into a fight with a dragon and barely any of us even had a scratch. And that's all for now. I'll be keeping an eye out for story times from now on and see if I actually can't post anything now that I have a few months worth of sessions under my belt! It was somewhere in the mid 20's, and my gut says 26. First comment was on 33. For those interested, it was this post that drew me in. I'm actually amused that it shared a news post with my favorite one off piece of canon of all time. That got even better when Pinkie actually had 8 legs during A Friend In Deed. But yeah, I'm pretty quiet, too. I'm sure my username pops up a few times earlier on, though. It was this comic that introduced me to "My Little Pony: Friendship is Magic"! We're already at the end of guest comics? Dang, that was short. Oh well, it was fun while it lasted. He wasn't kidding when he said he wasn't getting them from the usual sources. I was tempted to make a third, but I didn't want to flood him with submissions before I saw the reception my other two got. Handle Animal's power depends on the strength of animals around that can be handled. When all the opposition the party will face is beasts of the wild, it is more powerful than e.g. when the party is the only life in the fortress of an undead lord. Yeah, I know that. I guess I was expecting at least two more before we hit the end. Not that it diminished what we got, mind you. Heck, I wasn't expecting mine to be received as well as it did, to be honest. Okay...this is a bit of an odd one. Anyway, having decided my character (Sagara) would wield a rocket-powered spiked ball and chain as a weapon, I decided that the only possibly name for it, and for the spirit within, was Gamera. In a pathfinder session, one of our party had discovered the three words to control a Bottle of the Bound. After setting up a protection field inside a nearby church, we released the first creature to kill it. "HAHAHAHAHA! I AM MURRAY! THE DEMONIC TALKING DEMILICH!" "Everyone roll a Perform (Dance) check." As is, it's Perform (Cowbell). For taming the behemoth, you may now pick Godzooky for your animal companion. I totally recognize the Godzilla Cartoon Theme Song! So where is Godzuki? There was this time where my group had traced a mysterious little blob that had been spying on them from inside a hollow medallion and it escaped into a futuristic antiquities store on a black market asteroid. Instead of going with the obvious and hiding out inside an urn or a suit of armor, the damn thing managed to find its way into an old Dalek casing, an old Dalek casin that the owner of the store had salvaged from orbit and fixed up. Despite not having its original weapons systems, that pint sized tank demolished most of the marketplace trying to kill us and then flew off into deep space. What happened to Pinkie Pie? I think she's the GM? 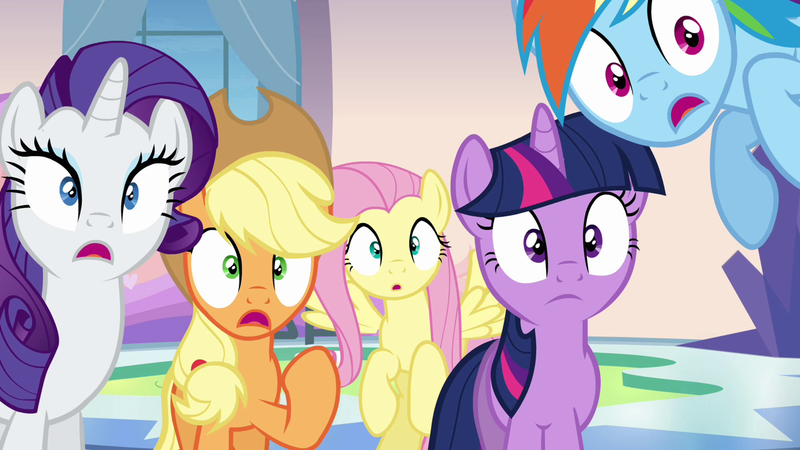 There's something pink behind Rarity, Twi, & AJ. I figured it was her curled up in a melodramatic panic, or perhaps otherwise incapacitated (we've been known to carry party members suffering fro. severe burns and missing eyes around for hours in amd out of game before we can fix them up) but I dunno if the toys'd fit that neatly in a Lego raft, paralytically poisoned pink party ponies' prevention from prancing notwithstanding. Yeah where is Pinkie...*looks at the first panel again* What in the blue blazes?! That looks like a tail with a bone sticking out of it! ...Did Pinkie get eaten?? ...well, it's enough for a rez. I wonder if pompoms made out of dead Bard can use their powers? Dang...So, how exactly did that tail come to be attached to that disembodied tail, anyhow? Also, is a tail really enough left for a rez? Finally, Specter, I have to ask; how did you post that picture as a thumbnail?--And how do people post text hyperlinks on this site, anyhow? All they need now is a large world of murderous things to conquer with there atomic dinosaur, and they'll be good. Assuming those guys weren't busy murdering each other. One of our groups gms, Josh, set up the following plot: a priestess of sarenrae tells us that one of her sisters went out into the forest. When she came back, she was in the company of a hydra with runes on it's scales, and several people that had gon missing from the village in the past few years. She was apparently the leader of the group, which proceeded to decimate the village, and take the villagers captive (for those that don't know about sarenrae, she is the goddess of the sun and forgiveness, and she DOES NOT DO THAT!!!). The woman who gave us the quest effectively said that she wanted vengeance for her sister, but couldn't do it herself. So we go to the forest, and are promptly attacked by some fiendish griffons, and humanoids that looked more arachnoid (not Driders, a homebrew race). A survivor from the village attack pulls us out. She tells us that the arachnoids are, in fact shape shifters, and the woman's daughter is one of the captives. I probably should know this but... what episode is this referring to? I like this strip. The little plastic minifigures make a funny change from the usual screen caps. Also Rainbow Dash's change from "I regret nothing!" to "I regret everything!" in four panels. Someone's Soft White Underbelly is showing! This exact scenario happened on an RP form I was watching. One of the group members was turning into a dragon against his will. He was going to lose his mind once he was fully formed and kill everyone around him. Everyone was about to run, knowing it wouldn't make a difference, but this one dumb elf (who incidentally is a dead ringer for Fluttershy in the game) rolled something like a 29 for Handle Animal. She calmed him down and saved everyone, then fell in love with his human form. and the like accurate manes is rather irritating, I might add. On that note, just how did you manage to find a hat for AJ? Yeah...if only most minis were less expensive. My friend ran a game where every player was an interesting mortal who died and ascended to a thematically-appropriate godhood. We had a whole huge pantheon going, and the petty infighting was GLORIOUS! I spent most of my time as the earth god dealing with the god of fire, formerly a terrible comedian who died trying to light up his own house for insurance money. And then C'thulu showed up. No, seriously. It turns out the powerful entity that returned all of us to life was Nyarlathotep in one of his disguises, and he was manipulating us into aligning the stars so that the old ones could return. Personally, I was not amused by this, but that's not to say it was all bad. Most awesome thing to come out of it was that fire god I mentioned earlier flying out to Jupiter and igniting all the gas to create a temporary new star to throw the constellations out of alignment and weaken the monsters. Because C'thulu is just a lot less badass in comparison when you can do s*** like that. My DM once threatened that if we didn't start behaving, he'd have decepticons show up in our high seas campaign. We got back in line and never actually encountered them, but considering his other threats have involved invisible ghouls coated with touch poison and fire-proof scrags, I'm really not interested in finding out what they were. Tarrasque me no questions, I'll grell you no lies.